As the saying goes, everyone is Irish on St. Patrick’s Day. That’s the Romanized Gaul who was living in England on the west coast, was kidnapped as a boy by those wild Celts during a raid and brought back to Ireland to be a slave shepherd, then escaped his captors, made it back to his home in England and felt totally estranged. He ended up going back to Ireland to try to convince them to be more peaceful. Somehow from all that people started dying things green and getting extra rowdy on March 17th. Any excuse for a party, I guess! Well, the same goes for tea, at least in our house. Time to get our “green” on for St. Patrick and all the others out there either born Irish or who, at least on this one special day, consider themselves to be Irish at heart. Of course there is the non-literal method here as in you are just enjoying something green or are using something green. You don’t literally have these things “on.” Green teas, teawares, and foods dyed green or even that are naturally green will all serve the purpose here and help you make that transcendence to “being green” that so many people talk about these days. You hear it everywhere, phrases like, “I’ve gone totally green” (and they don’t mean with envy, apparently). Actually, I’m being a bit facetious. This is a totally different kind of “going green” – one that you can enjoy. Bring out those green teawares. Any shade will do, from lime sherbet green to emerald green and everything in-between. Teapots, mugs, plates, sugar and creamer, cups and saucers, and so on, will set the stage here. (I would recommend for your linens, though, something a bit contrasting so all that green doesn’t clash or get lost. A nice Irish lace tablecloth would be good, for example, especially if laid over a solid-colored cloth in some hue that coordinates with those teawares. 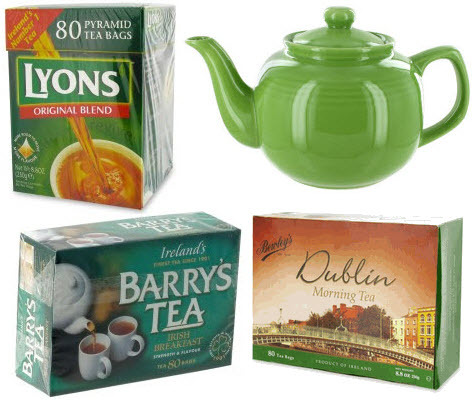 Green teas would seem natural and are certainly an option as I had talked about in this earlier article, but you might want to go with an Irish favorite instead such as one of their top brands (Lyon’s, Barry’s, or Bewley’s) or a nice Irish Breakfast blend steeped strong so it can stand up to some milk and sweetener if you care to venture that far here. 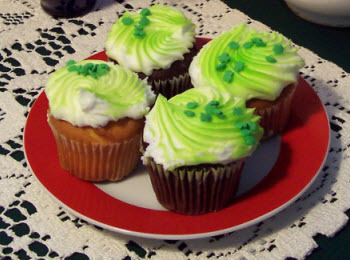 If you feel the need for even more green, how about some green treats: lettuce/spinach salads, celery, stuffed green peppers, or the good stuff such as chocolate cupcakes with icing dyed green or cookies in the shapes of shamrocks and dyed green (with food coloring of course). Feeling that green yet? If not, just have another helping of everything. That should do the trick!